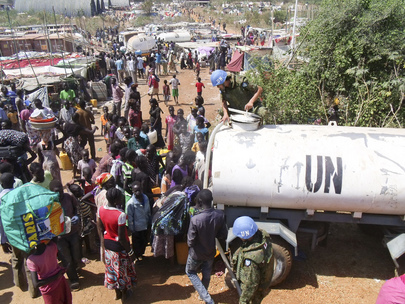 UNMISS Officers Provide Water to Civilians Seeking Refuge, Juba. On Friday, the Indian ambassador to the United Nations (U.N.), Asoke Mukerji, made the sombre announcement that three Indian peacekeepers had been killed in ethnic fighting in Akobo, South Sudan. Their deaths promise to complicate U.N. Mission in the Republic of South Sudan (UNMISS) peacekeeping operations, particularly in outlying posts in the states of Jonglei, Warrap, and Unity. This in turn poses a serious political, diplomatic, and military challenge to the Government of Japan, which recently expanded its commitment to the UNMISS peacekeeping operations. With the internal security environment now deteriorating, it is clear that Juba is no longer the safe place it was when former Prime Minister Yoshinko Noda first deployed Japanese civilian and military personnel in November 2011. Just this week, at least 500 people were reportedly killed in fighting in the capital, which left the “streets deserted except for military vehicles.” The Japanese now find themselves on the front lines of an internal political crisis that threatens to push the country into civil war. The Government of Japan certainly did not intend to put Japanese peacekeepers in such a precarious situation when they committed a corps of Ground Self Defence Force (GSDF) engineers to UNMISS. Japanese peacekeeping activities were until recently restricted to Juba, and later expanded to the three southern Equatoria states where they had sought to minimize the likelihood that Japanese peacekeepers – and their Rwandan military security protection unit – would be required to use deadly force. Unfortunately, South Sudan’s internal security environment has fundamentally changed. Over the weekend, the world took notice when US military personnel were wounded while evacuating American citizens from Bor, the capital of Jonglei state. Now, violence in the capital is making headline news. With the situation rapidly deteriorating, Japanese policymakers must realize that the probability of their peacekeepers being drawn into the conflict is increasing day by day. But, are Japanese forces really prepared for the deadly force contingencies on the table, including a possible overrun of their U.N. compound in Juba? These limitations have frustrated Prime Minister Shinzo Abe, who has been vocal about the need to change his country’s interpretation of the constitution. An advisory committee has already produced a draft report outlining Japan’s right to collective self defense – and the Prime Minister spoke at the United Nations three months ago about Japan’s “proactive contribution to peace” and greater engagement in UN operations. Unfortunately for Abe and his supporters, “it will likely take years to change the law“ – despite his desire to fast track changes. The Akobo attack and Juba violence therefore raise critical questions for both the Government of Japan and their UNMISS partners. Given the escalating internal conflict within South Sudan, one must ask whether Japan’s constitutionally limited rules of engagement are flexible enough to enable Japanese peacekeepers to properly respond to the full spectrum of contingencies. If not, one must question whether the Government of Japan and its UNMISS partners are truly prepared to accept all scenarios in which Japanese peacekeepers are unwilling to use deadly force. Part of the problem centres on unrealistic expectations. Two years after their initial deployment, the Japanese public remains relatively disengaged and wholly unprepared for the killing of a South Sudanese by a Japanese peacekeeper. Nor is the global public prepared for the possibility that Japanese peacekeepers might not provide military protection to fellow UNMISS peacekeepers and South Sudanese civilians facing mortal danger – the central component of the UNMISS mandate. And, there remain serious questions as to how the Japanese peacekeepers would respond if their Rwandan security detail were overrun by a full-on assault on their Juba compound. The Government of Japan therefore needs to critically re-evaluate its commitment to the UNMISS operation. The simple fact is that Japan remains unable to accept the full weight of modern peacekeeping operations without fundamental political, legal, and social changes. While the Abe Administration is pressing forward on this account, he has yet to complete the task. In the meantime, Japan’s peacekeepers remain ill prepared to tackle many serious contingencies requiring use of deadly force. Michael Edward Walsh and Jeremy Taylor are PhD students in the Department of Politics and International Studies at SOAS, University of London. Mr. Walsh is also a non-resident WSD-Handa Fellow at Pacific Forum CSIS. I met JSDF soldiers in Southern Iraq in 2004, which was infinitely less safe than South Sudan. they simply had force protection provided by other countries. would suggest China, North (and South) Korea are a slightly more relevant reason for Japan to review its Constitution.